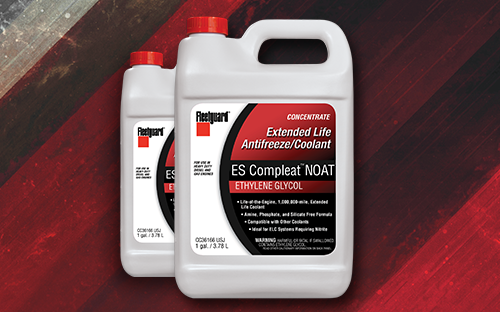 ES Compleat NOAT is a lifetime, heavy duty fully formulated antifreeze/coolant that is amine, phosphate, silicate, and 2-ethylhexanoc free. NOAT is a nitrited organic additive coolant combining the best of nitrite/molybdate liner pitting protection and organic additive extended life benefits. For use in Heavy Duty ELC, NOAT and EC1 systems. • Low maintenance with no SCA precharge and long service life. *To maintain the protection provided by ES Compleat NOAT the proper level of inhibitor must be present. this can usually be achieved by topping off the cooling system with premixed ES Compleat NOAT. The user is responsible for ensuring proper additive levels and coolant pH though the use of field or lab testing and the addition of new coolant and/or extender when necessary. The recommended test interval is 300,000 miles, 6,000 hours, or 1 year. Extender addition is required at 600,000 miles to achieve 1,000,000 mile coolant life. The test interval is a precautionary recommendation intended to prevent progressive, severe engine damage.